Formerly known as Somesvara, the Mana-Mandir Ghat was built in 1770 by Maharaja Sawai Jai Singh II of Jaipur as part of his beautiful palace by the Ganges River. Privately-owned, like some of the other ghats along the Ganges, Mana-Mandir Ghat is directly connected to the beautiful palace with the ornately decorated Hindu Observatory on the rooftop. Since Maharaja was known to be an advocate of astronomy, he championed the need for the nation to be educated in the subject. The observatory, like all other observatories commissioned by Maharaja in Delhi, Mathura, Jaipur and Ujjain, the one in Banaras was decorated by ornate window casings and a stone balcony overlooking the northern part of the ghat. Four main astronomical instruments are found in this observatory. Unfortunately, these instruments are not operational anymore compared to those found in Jaipur. The ghat and the palace had since been renovated in the 1850s and in 1912 under the sponsorship of the King of Jaipur. The palace and the Mana-Mandir Ghat are still maintained by their descendants. 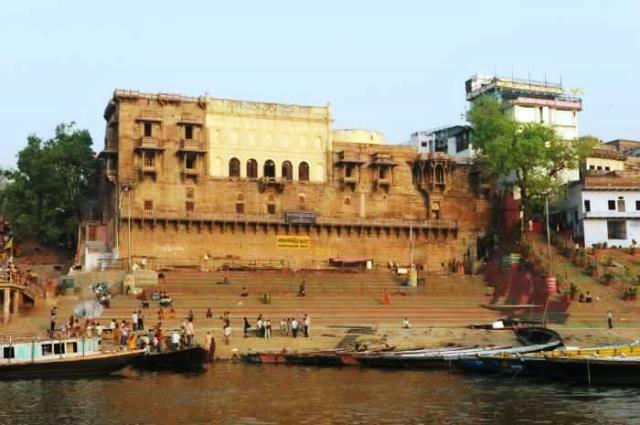 Most of the ghats in Varanasi were built when the city was under the control of the ruling class, the Maratha, a caste belonging to the Maharashtra. Some ghats are used for bathing while others as cremation sites. Most ghats are related to several religious mythologies and legends as well as creation histories in Hinduism, Buddhism, Jainism and other religious sects associated with the Ganges River. Even if privately-owned, the Mana-Mandir Ghat has since become a site for the thousands of devotees and pilgrims converging in Varanasi during local religious festivals, cultural events and musical parties. Associated with the worship of Someswar (Somesvara) who is known to be the Lord of the Moon, Mana-Mandir Ghat is in close proximity to the Somesvara, Dalabhesvara, Remesvara and Sthuladanta Vinayaka shrines. Other numerous religious and cultural festivals are held here regularly just like in the nearby ghats. During Holi, the Hindu spring festival of color celebrated during February or March, people celebrate it in nearby the Dalabhesvara shrine while people can be seen using the ghat to take a dip in the Ganges. Pilgrim priests are readily available to offer their services during these times. Taking the Ganges River cruise will provides a scenic adventure where many ghats, including the Mana Mandir Ghat, are seen in their grandeur especially during evenings. Various cultural festivities and traditional celebrations can be enjoyed with panoramic views of the temples and other places of worship from the river. Travelers will be able to experience the interplay of sounds made by priests, chanting Sanskrit mantras being accompanied by the symphony of drums and cymbals. Boat rides are also for hire to those who want to take a private viewing of the old city’s riverbanks and its attractions without waiting for the cruise’s schedule. The best time to go to Mana-Mandir Ghat is during evenings, where it shares the magnificence of the Agni Pooja (Worship of Fire) performed in the nearby Dasashwamedh Ghat. Travelers are also recommended to visit this destination during festivals such as the Dussehra, Holi and Diwali.